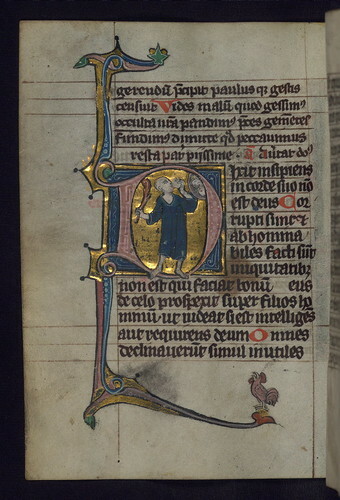 Franciscan Liturgical Psalter, Initial D with fool holding a club and biting a stone, Walters Manuscript W.111, fol. 113v, originally uploaded by Walters Art Museum Illuminated Manuscripts. This Psalter was made for Franciscan Use in Cologne in the late thirteenth century. It was owned in the late fifteenth or sixteenth century by the Augustinian nuns of St. Cecilia in Cologne, who added the Calendar, the Breviary texts, prayers, and the Collect at the end. The manuscript is written in Latin and in the Ripuarisch dialect spoken in the Cologne region. The historiated initials, as well as bar borders topped with grotesque compare closely in their style to Walters Ms. W.41 and to the two graduals made for the Franciscans of Cologne in 1299 by Johannes von Valkenburg (Cologne, Diözesanbibliothek, Ms. 1B, and in Bonn, Universitätsbibliothek, Ms. 384). As a whole, it is a well preserved example of High Gothic illumination in Cologne.